Best Apocalypse Now quotes, with movie clips, ranked by fans. This list of great movie quotes from Apocalypse Now collects all of the most famous lines from the film in one place, allowing you to pick the top quotes and move them up the list. Quotations from movies are repeated all the time in other movies, on television, in speeches and in day-to-day life, so having a good knowledge of good movie quotes (and having resources useful to search movie quotes) have become essential. Many of the most notable quotes come from sources you may not even know about, some could even be the most memorable Apocalypse Now quotes or come from some of the other most quotable movies of all time. Consistently named one of the best movies of all time, Apocalypse now tracks a covert mission to take out a highly decorated US Army officer who has inserted himself as a god among men in a Viet Nam tribe. The all-star movie cast includes Marlon Brando, Martin Sheen, Robert Duvall, Lawrence Fishburne, and Harrison Ford. The movie was nominated for eight Academy Awards including Best Picture and best Director for Francis Ford Coppola. 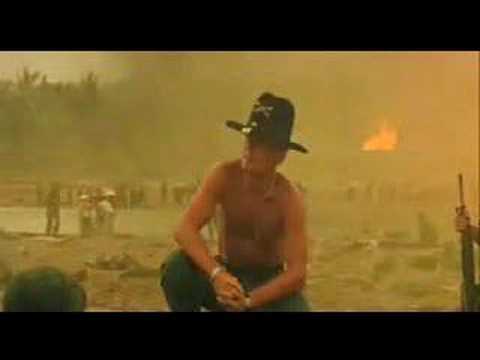 This list includes all the best Apocalypse Now lines and moments, just as they appeared in the actual movie script. Whether they are funny quotes, sad quotes, quotes about love or death, all the most famous Apocalypse Now quotes are here. Kurtz: I watched a snail crawl along the edge of a straight razor. That's my dream; that's my nightmare. Crawling, slithering, along the edge of a straight razor... and surviving.